The Hada Labo Tokyo Anti-Aging Hydrator is a really great retinol serum that will work well for anyone who may have issues with dehydrated skin. The texture and feeling of this retinol serum are super lightweight, and when you first apply it onto your skin, it feels kind of oily, not in a heavy way, but it leaves it feeling ultra-hydrated even after the first application. Hada Labo Tokyo Anti-Aging Hydrator is really easy to apply because it comes in a jar with a pump, which I love. This product goes a long way so you only need a really small amount to cover your entire face and neck, even 1 pump seems like too much. After using Hada Labo Tokyo Anti-Aging Hydrator, my skin was so very moisturized and hydrated. This product would be great for anyone suffering from dry skin because it really brings the hydration and life back into the skin, even after using it for a short amount of time. After using this retinol cream for a longer period of time, my skin continued to be super hydrated and supple; I felt like my skin was glowing. It plumped up my fine lines and wrinkles really nicely, and left my skin feeling nice and smooth. Overall, Hada Labo Tokyo Anti-Aging Hydrator is a really great retinol serum that will leave your skin feeling fresh, plump, and like it just had a tall glass of water. The texture and feeling of Hada Labo Tokyo Anti-Aging Hydrator is super lightweight and it feels slightly oily on the skin. Hada Labo Tokyo Anti-Aging Hydrator is super easy to apply because it comes in a bottle with a pump. Since this product is so thin, you definitely don’t need more than 1 pump for your entire face and neck; one pump is almost too much because it spreads out so much on the skin. This product takes kind of a long time to dry down, about 2 minutes. But, even when it’s technically dry, it leaves a sticky feeling on the skin which isn’t my favorite. Hada Labo Tokyo Anti-Aging Hydrator doesn’t have any added fragrance and it really doesn’t smell like much at all. After using this product for a short period of time, my skin was extremely hydrated and moisturized. After using Hada Labo Tokyo Anti-Aging Hydrator for a longer period of time, my skin was feeling very, very hydrated and the hydration was definitely plumping up my skin and bringing it back to life. Because my skin was nice and plump, my fine lines and wrinkles were smoothed out; my skin looked smoother and better overall. 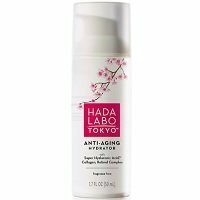 Hada Labo Tokyo Anti-Aging Hydrator is full of a ton of interesting ingredients, and a few of those ingredients are hydrolyzed collagen, hydrolyzed hyaluronic acid, and sunflower seed oil. Hydrolyzed collagen is great for helping with anti-aging because it can help to restore hydration and suppleness to the skin, as well as help heal skin damaged by the effects of aging. Hydrolyzed hyaluronic acid is a powerful humectant that can help restore the skin’s moisture and help plump up the skin which can reduce the signs of fine lines and wrinkles. Sunflower seed oil is a rich source of vitamin E which can help the skin combat inflammation and irritation. It can also help restore moisture and hydration to the skin. These three ingredients, in combination with all the other great ingredients, should greatly help reduce the signs of aging and fine lines and wrinkles. The cost of Hada Labo Tokyo Anti-Aging Hydrator is $17.99 for 1.7oz which comes out to $10.58. This is a very average price for a retinol serum. Hada Labo Tokyo Anti-Aging Hydrator has a 30 day money back guarantee so you can try it risk free, which is always great. To buy Hada Labo Tokyo Anti-Aging Hydrator, click here. Short Term Results My skin was super hydrated. Ingredients Hydrolyzed collagen is great for fighting signs of aging.